Indian business magnate Reliance’s Mukesh Ambani overtook Alibaba Group founder Jack Ma to be the richest person in Asia as he positions Reliance Industries Ltd. to disrupt the e-com market in India. 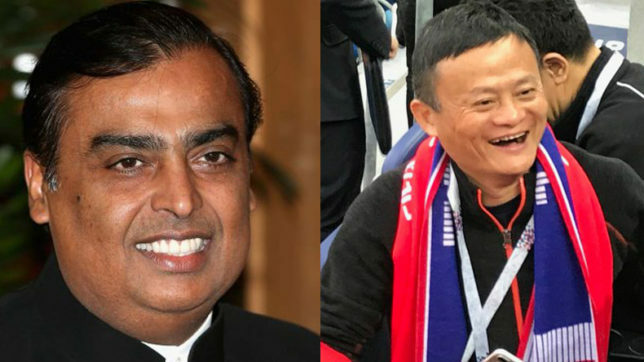 As per Bloomberg Billionaires Index, Mukesh Ambani’s net worth was estimated to be around $44.3 billion on Friday while Jack Ma’s stood at $44 billion on Thursday in USA. It showed 1.6% rising in Ambani’s wealth. Know more. As Reliance doubled its petrochemicals capacity as well as the success of his disruptive telecom upstart Reliance Jio Infocomm Ltd made Ambani to added $4 billion to his business his business. Recently, he had also revealed his plans to leverage his 215 million telecom subscribers to expand his e-commerce offerings, taking on the likes of Amazon.com Inc. and Walmart Inc. Recently, Ambani said that Reliance saw its “biggest growth opportunity in creating a hybrid, online-to-offline new commerce platform,” involving the group’s Reliance Retail Ltd. and Reliance Jio businesses. Reliance is also coming up with a fiber-based broadband service that would be the biggest greenfield fixed-line rollout anywhere in the world. Mukesh Ambani is the son business tycoon Dhirubhai Ambani and elder brother of Anil Ambani. After father’s death in 2002, the ownership came to the brothers. In 2005, they split the company. Mukesh Ambani is chairman of India’s refining-to-telecoms conglomerate Reliance Industries. Ambani knows the art of executing large-scale projects magnificently. He constructed the world’s largest refining complex in Jamnagar as well as owns the most-widespread mobile data network globally.